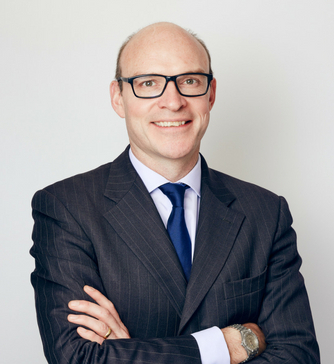 Mr Andrew Sankey is a Consultant Orthopaedic Surgeon at King Edward VII's Hospital with a specialist interest in shoulder and elbow surgery, with an NHS practice at The Chelsea and Westminster Hospital in London. He studied at St John’s College, Cambridge and then St Mary’s Hospital, London, and qualified in July 1997. He trained as a Specialist Registrar in Trauma and Orthopaedics on the University College Hospital/Middlesex rotation in London. A 12-month Fellowship in Upper Limb Surgery at the Shoulder Unit at St Mary’s Hospital, and research in the Department of Biomechanical Engineering Imperial College, allowed the development of the clinical and academic interests he maintains. Andrew completed his sub-specialist training at the Shoulder Unit at University College Hospital. Andrew’s work has been presented nationally and internationally including the Royal Society of Medicine, British Elbow and Shoulder Society and European Shoulder and Elbow Society. Andrew has published extensively in peer-reviewed journals. He is the author of a number of book chapters on the Shoulder. He has a particular research interest in shoulder arthroplasty and proximal humerus fracture fixation methods. 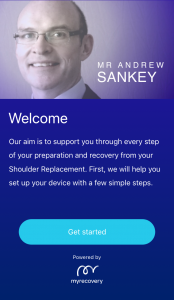 Andrew has also created a complimentary app to support his patients through their preparation and recovery from surgery. 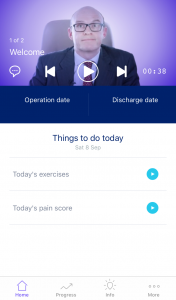 It is customised to each patient and includes videos where he highlights key points for each stage. These videos change as you progress in your journey and provide interactive exercise plans, tools to track your progress and other useful information. You will be able to login after you have downloaded the app.